Car Vexactitude se distingue de la verite, et la conjecture n’exclut -pas la rigueur. Precocious impasses in the drive’s link to the mother are common occurrences in child care. Rather than acting as the privileged vector to an outside world, ensuring the subject’s inscription in the field of the grand Autre, the big Other, the drive fixates and encloses itself in a vicious and unproductive circle. An object – whether it be the breast, faeces, the voice, or look – takes on a value of exclusivity, either because it becomes the choice object, or because it is the impossible object. From that moment on it will be as if the loop that the drive makes from the child to his mother, around the partial object (Lacan’s objet petit a), has been interrupted, or closed in on itself. Based on a cure of a diabetic adolescent who refuses to take her medicine correctly, we will show how psychoanalysis allows this patient to free herself of blocks associated with the medical discourse. The function of repetition will be highlighted through two series of recurring dreams; the link between repetition and enjoyment (puissance) will also be examined. Furthermore, this paper will call attention to the way psychoanalysis brings to light a subjects identifications, allowing him to set his sights on his desire by getting rid of certain symptoms which sign away his future. Pascals Wager … to which, from my Rome report on, I indicated that instead of a thousand other futile occupations, psychoanalysts should turn their gaze. Putting the title in this way is meant to reflect two things. First, that Jacques Lacan is unequivocal in his assertion that the work of Blaise Pascal, and in particular his Wager, is of ‘inestimable value’ for the psychoanalyst. And second, that it is not at all clear – not to me and not to anyone I have read – why he thinks that the seventeenth century genius should have so much to offer to a praxis that saw the light of day almost 250 years after his death. In fact, as he presents the Wager, Lacan feels the need to protest that it is not out of date, that he is not lending his support to a piece of religious obscurantism, but is restoring to its proper place one of the most extraordinary intellectual feats that has ever been undertaken. 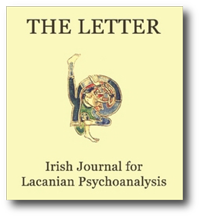 This paper represents an attempt to unpack some of the key elements in Lacan’s seminar on Anxiety in the context of three clinical examples. My exploratory focus will be on the points at which anxiety appears in each case as it is framed by and within the field of the specular image via the scopic and invocatory drives; the ways in which anxiety becomes narrated as moments at which the formations of the unconscious are made immanent; and, the movements/articulations/actions made by each client which implicate the correlation between the affect and its effect. Commensurate with this focus will be a serious engagement with the particular ways in which anxiety is caught up with ‘m-other-ing’. The whole problem of the perversions consists in conceiving how the child, in relation to the mother, a relation constituted in analysis not by his vital dependence on her, but by his dependence on her love, that is to say, by the desire of her desire, identifies himself with the imaginary object of this desire in so far as the mother herself symbolizes it in the phallus. The link to Freud is obvious, that is, the denial of castration, although Lacan adds something to it, by focusing on the part played in this by identification. The perverse subject is the one that identifies itself with the imaginary phallus of the Other. In the extreme, life is what is capable of error. Error is at the root of what makes human thought and its history. The opposition of true and false, the values we attribute to both, the effects of power that different societies and different institutions link to this division – even all this is perhaps only the latest response to this possibility of error which is intrinsic to life. If the history of science is discontinuous, that is if it can be analyzed only as a series of ‘corrections’, as a new distribution of true and false which never finally once and for all liberates the truth, it is because there, too, ‘error’ constitutes not overlooking or delaying a truth but the dimension proper to the life of man and to the time of the species. Experience indicates that patients often enter into analysis with the complaint that they can’t manage to do the things they want to do; they feel reluctant or unable to act within one or more domains of life, notably in fields such as love and work. According to Freud in Analysis Terminable and Interminable, analysis often – but not always – results in overcoming these kinds of inertias. In this paper we will discuss inhibitions as an obsessional strategy for dealing with desire. Like other obsessional neurotic symptoms, for example compulsions, inhibitions have a structural function in the obsessional strategy of denying desire. Along this line of reasoning both the absence of activity (inhibition) and excess of it (compulsion) are attempts at avoiding a confrontation with desire. Desire is an issue the obsessional neurotic puts under a taboo.